Now that we have a successfully built project, let’s look at the process of scripting in Armory. Scripting works by attaching scripts to in world objects. There are two mechanism, Node based scripting or Haxe based. Let’s look at both processes. 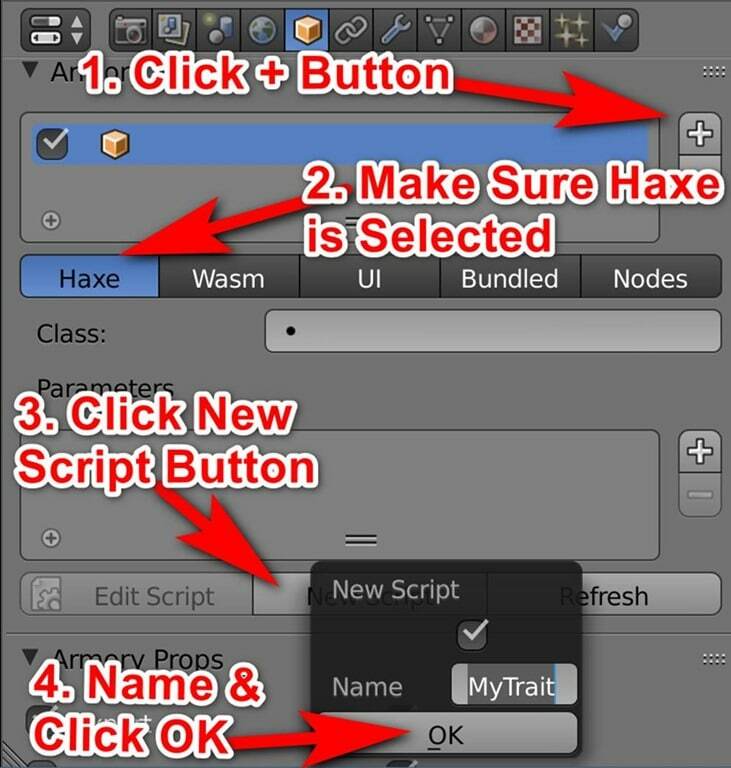 Let’s start with a Haxe script example. Assuming you have the default scene still, select the default cube (if not, create a new one using Add->Mesh->Cube) in Blender. 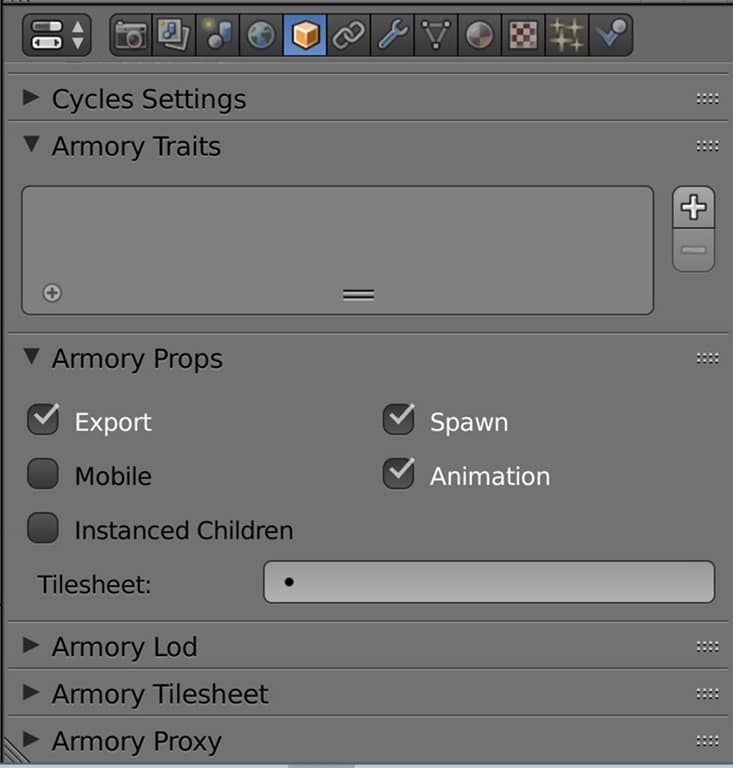 With an object such as the default cube selected, locate the Property tab and there are several categories specific to Armory, Armory Traits, Armory Props, Armory Lod, Armory Tilesheet and Armory Proxy. This is where we directly apply Armory properties to objects. Now we want to create a new Trait, click the + icon to create a new Trait. The step by step details are shown in the video below. This will create a script called MyTrait.hx in your project directory. 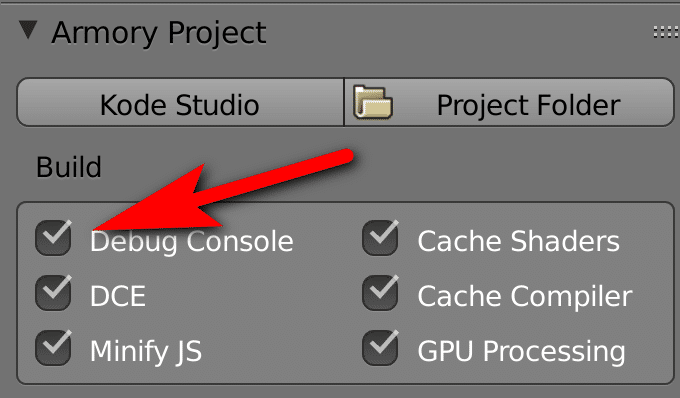 Armory has a built in code editor, Kode Studio, which is based on Visual Studio Code. 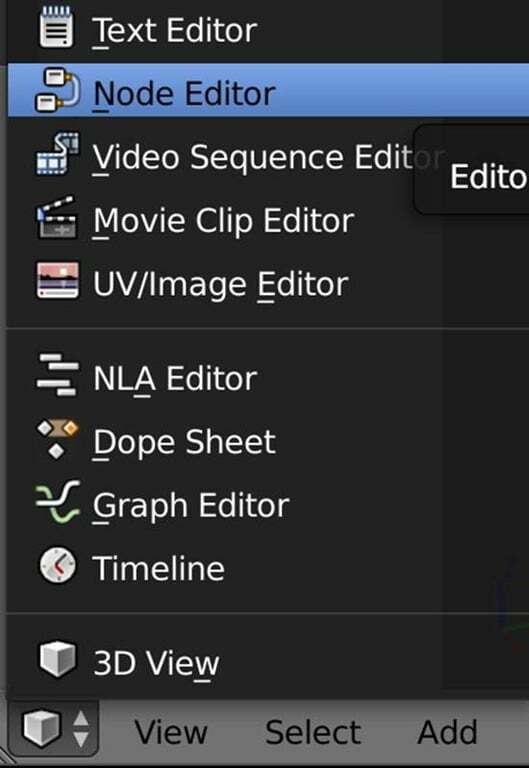 Click the Edit Script button and the selected trait will be opened in the editor. 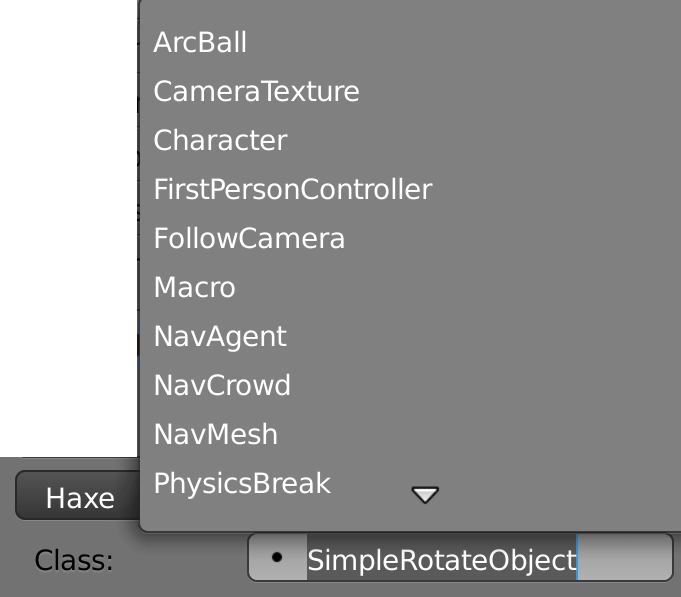 Right below select the Class selection and choose the bundled trait you want to use. Programming via nodes is pretty straight forward, you simply connect lines between various different nodes to make your program flow. First we need an event to start things off. 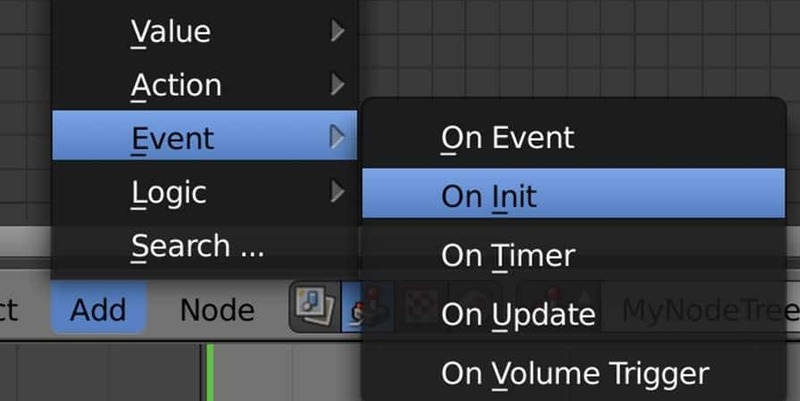 Select Add->Event->On Init. OnInit is an event that is called when your object is being created, this will be called only once and is called before the node is displayed. Generally, you will use OnInit to do initial setup for the attached object. Now add two more nodes, a Variable->String and Action->Print. Now connect the red pin from the Out on the OnInit node to the In on the Print node. Next connect the String out from the String node to the Value in on the Print node. 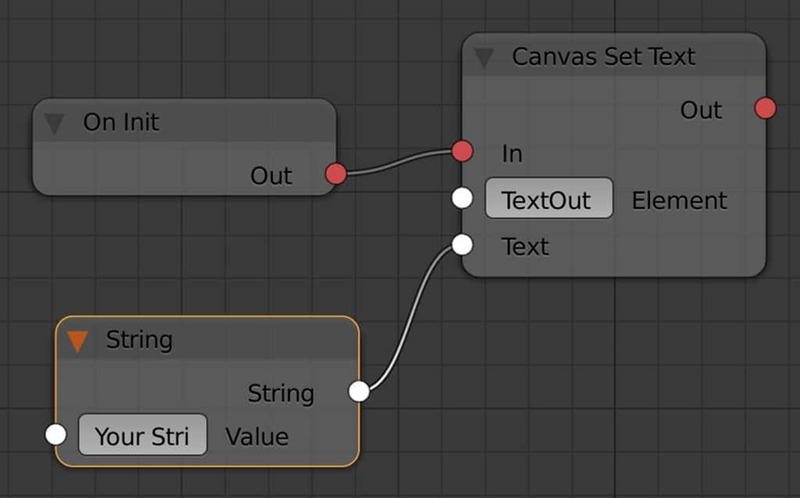 In the String node in the value field, double click and enter “Hello From Nodes”. 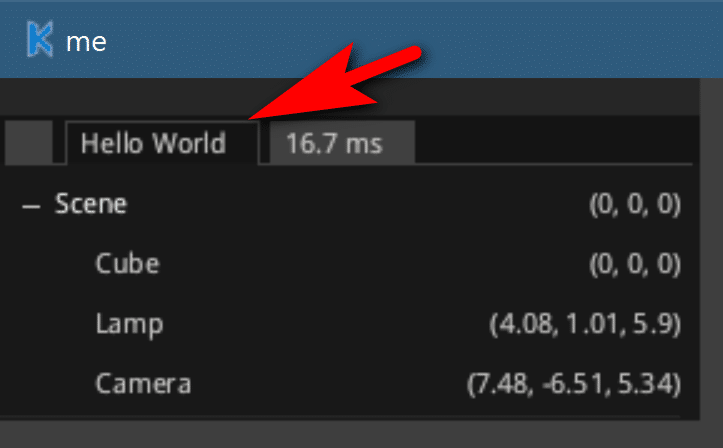 Unfortunately in Armory 0.4, the Print Node is currently not working properly in Windows! When developing, the ability to dump information out to screen is invaluable, especially as you are learning. Due to the fact trace() seems to be currently broken on Windows but working on other platforms, we need a work around. Thankfully there is just such an option, the Canvas, which we will illustrate now. The Canvas is a 2D UI layer, handy for things like high scores and the like, but in this case also great for debug information. We need to jump through a few hoops though. First, we need to create a Canvas. 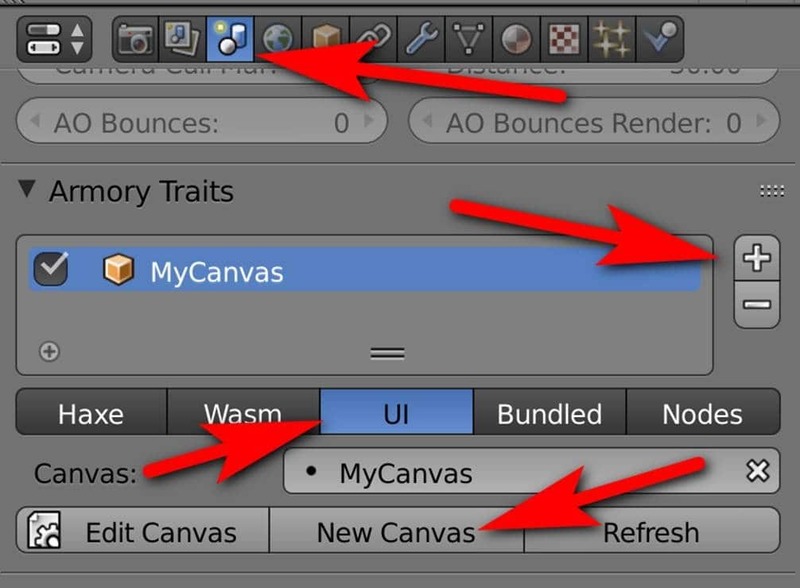 Switch to the Scene tab, locate Armory traits and click the + Icon, then switch to UI and click New Canvas. 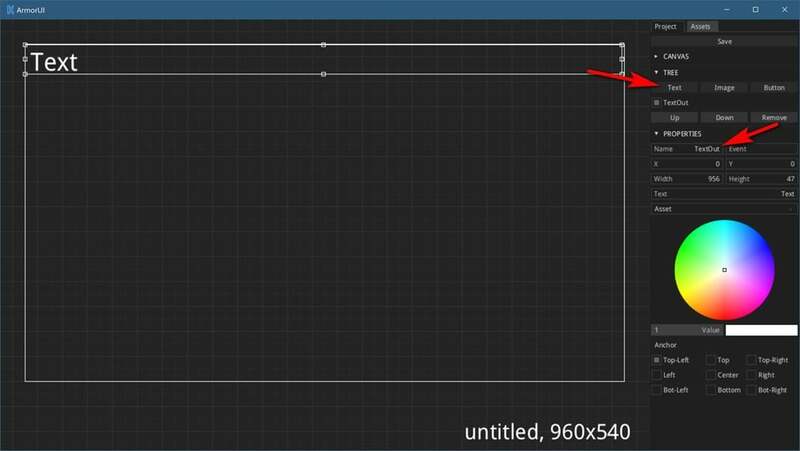 Now click Edit Canvas, this will bring up a UI editing window. Now click Text to create a new text field, change it’s name to TextOut and resize the text box to the full width of your window. Click Save to the top right when done editing. Now when you run your game, anything your print will be displayed in the debug console which is overlain over your running application.